While it is true that our society is not an “Orthodox” society: there is no tsar setting the example of piety, we are not surrounded by Orthodox churches and monasteries, our culture is, in fact, clearly at odds with the principles of Orthodoxy. Nevertheless, each one of us still has the opportunity to choose to struggle against our passions and to unite ourselves to Christ. 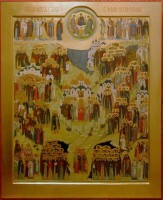 Congratulations, Brothers and Sisters, on the feast of All Saints of Russia, on which we commemorate all those saints who have shone forth in the Russian land. We know from sacred history that Russia was not always a land united in its love for God and for the Holy Orthodox Church. Ancient Russia was a pagan land, devoid of the light of the Gospel. It was a land in which war between the various princedoms was common as there was no common faith, no sense of unity among the people. Lamenting this situation, St. Vladimir, the prince of Kiev, understood that the people of Kievan Rus’ were in need of a faith to unite them first to God and, thus, to one another as well. The envoy’s impression of Orthodox Christianity was so profound that they not only advised St. Vladimir to adopt Orthodoxy as the faith of Russia, they announced that, having fulfilled their mission, they would now return to Constantinople to live where God dwells with men. At this report, we understand that Prince Vladimir eventually decided to accept Orthodox Christianity himself and requested that priests and bishops be sent from Byzantium to baptize his people. This event was truly a turning point, a new beginning for Kievan Rus’, a new beginning that led to such a flowering of holiness that to now recount all the saints of Russia is not at all an easy task. Referring to the first flowering of Christianity in the ancient Roman empire, the Church father Tertullian famously said, “The blood of the martyrs is the seed of the Church”, and what was true in Ancient Rome turned out to be equally true in Russia. Beginning with the martyrdom of Sts. Boris and Gleb, and continuing on to the countless Russian ascetics who were martyrs of a different type, those who became dead to their passions through a life of spiritual struggle, the land of Russia became a spiritual meadow, with radiant examples of holiness appearing everywhere. As with the flowering of monasticism in ancient Egypt, the wilderness areas of the Russian North became filled with hermits and ascetics who shone as examples of holiness inspiring the faithful in their own struggles. In turn, churches and monasteries appeared everywhere, lanterns set on the hill of Russia calling all the faithful to the life of holiness. This entire edifice was led by princes, and eventually tsars, who took the words of the Savior to heart, “if you would be great, you must become the servant of all”. Indeed, many rulers, such as the great St. Alexander Nevsky, were also great examples of piety and holiness, showing the example of Christ by sacrificing themselves for their people. If we fall prey to such a manner of thinking, we are surely deceiving ourselves. Without a doubt, the saints of Russia tread the narrow path of struggle against their passions, but this narrow path is equally open to us today. 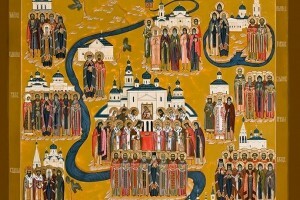 There is no great mystery as to how so many people acquired holiness within the Russian Church… those who became holy were, very simply, those who acknowledged their sinfulness, turned to God in repentance and truly embraced the life of the Church, the life of struggling against the passions. The saints of Russia devoted themselves to Christ considering that the cares of this life will soon pass away, but to live in Christ is to live forever. Has this changed? Is it not possible for us to imitate their example? Through the prayers of all the saints of Russia, may God bring us to our senses and establish us firmly on the path of salvation. May we decide from this day to come frequently to Holy Confession and Communion, to perform good deeds for our neighbors, to struggle against sinful thoughts and to build the sure foundation of our spiritual lives by remembering God throughout the day, by praying to Him in the morning and evening and by humbly accepting whatever crosses God allows for our salvation. 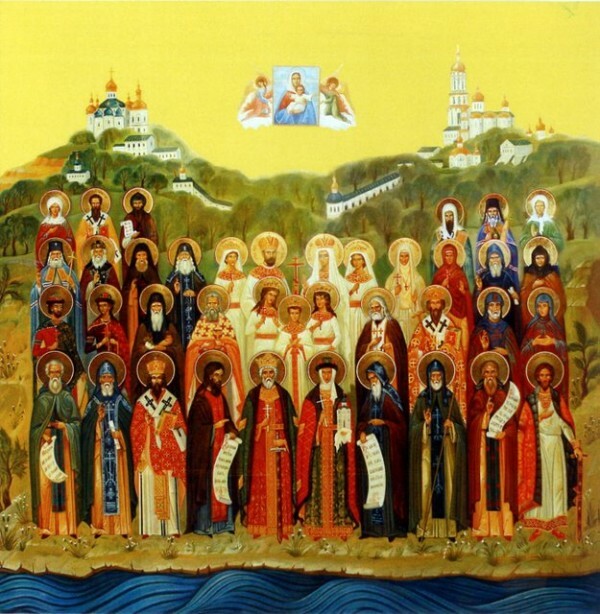 In this way, brothers and sisters, we truly honor the saints of Russia, not by simply remembering their feast day once a year, but by imitating their example of spiritual struggle for the sake of Christ. Through the prayers of All the Saints of Russia, may God have mercy on us.